New Construction Home For Sale in Port. St Lucie FL! St. Andrews Park is the perfect place to build your dream home and design the interior finishes according to your preferences! For upgrades, additional charges may apply. Have you ever imagined yourself living in a beautiful home with upgrades much like you see in million dollar homes, but only for the fraction of the cost? Do you want to live in a vivacious area that’s close to stunning unspoiled beaches, first-class golf courses, acres and acres of beautiful nature preserves, and with a fun calendar of cultural and art festivities? This sounds too good to be true, right? But let us tell you, when it comes to St. Andrews Villa Homes, good does not even begin to describe it. The images below are of the model home – Biltmore. These are used for illustration purposes only. St. Andrews Park Villas bring you the Biltmore model, a spectacular 2 bedroom 2 bathroom energy efficient home that boasts of high-end upgrades. Combining luxurious interiors, excellent workmanship, energy-efficient features, this is a perfect home, vacation villa, and even a paradise to call your own as you enjoy the fruits of your labor. This concrete block home has solar lights which save energy costs, and all the windows and sliding glass doors are made of impact resistant glass. The living area of this home has R-30 fiberglass ceiling insulation that keeps your home cool despite Florida’s warm weather. The great room has already been painted with classy neutral colors that will fit a wide range of design concepts. You’ll also notice the high ceilings seen all throughout the home. The door at the center on the photo leads you to the den. You can customize your den to have a modern design below and also choose the type of flooring you prefer. If in your previous home there just wasn’t enough room, then you’ll love this new found space. You can even transform this into a mini library. Moving on to the kitchen of this St. Andrews Park villa, it has chic granite countertops and breakfast bar featuring decorative edges, and plenty of storage space thanks to the 42″ recessed panel birch cabinets. Taking a closer look, you’ll see that the kitchen has a beautiful lighted 4″ backsplash. The kitchen also has upgraded pull-out spray single-faucet. The home has a lovely breakfast nook perfect for starting the day and enjoying a heartwarming meal with the family. There is also a designated laundry area close to the kitchen making doing day to day chores a breeze. The master bedroom of this St. Andrews Park villa is going to be your private sanctuary. This master bedroom also features a walk in closet. The master bathroom has a roman-style tub perfect for relaxing after a long and productive work day. It also features designer lights over the double vanity area, elegant chrome Moen® faucets, and ceramic bath accessories. It has also has a clear glass shower enclosure in chrome. The guest bathroom, attached to the guest bedroom for additional privacy, features a bathtub. Much like the master bathroom, it also has designer lights over the vanity area, a granite vanity top, as well as chrome Moen® faucets, and ceramic bath accessories. The St. Andrews Park Villas HOA fees cover a myriad of things including lawn maintenance, roof insurance, pest control, high-speed internet, cable TV, and maintenance of the home’s exteriors and community amenities. Speaking of amenities, you will surely love what St. Andrews has to offer! 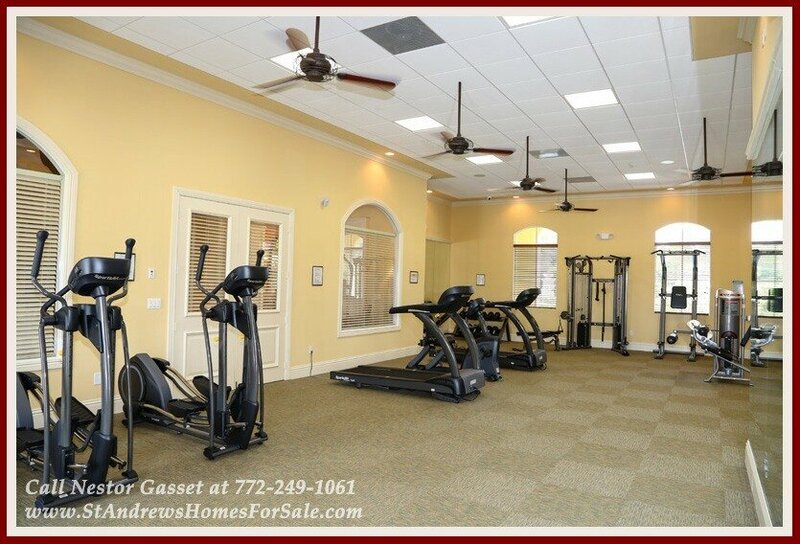 The community clubhouse features a fitness center, a game room, and a large swimming pool! The clubhouse also has a grand gathering room that even has a partial kitchen perfect for get-togethers with neighbors and friends, and even celebrations! As a future resident of St. Andrews Park Villas, sticking to or even starting a workout regimen is going to be a walk in the park! When you go the fitness center in the community clubhouse, you’ll definitely find the equipment you need for your workout. St. Andrews Park Villas and Homes for sale in Port St. Lucie are just within walking distance to Publix shopping center! Golf enthusiasts will be pleased to know that The Champion Turf Club at St. James, a public course offering seasonal and annual memberships, is just across the street from the subdivision a few steps away! There are also many beautiful nature preserves to explore close to the area including the Oxbow EcoCenter’s 225 acre preserve. This is the floor plan of this home. You can also view other available lots in St. Andrews Park to build your home on. Perhaps you’d like to live a few steps from the community’s tropical pool or have a home that backs up to a relaxing view of the canal or the preserve area. Interested in this home? Call Nestor Gasset at 772-249-1061 or text “BuyVilla” to 561-623-957! Make your home buying experience a breeze by working with an experienced buyer’s agent who holds a solid track record backed by testimonials from satisfied clients! Did you know that having an agent to represent you in the sale of your brand new home does not cost you anything? The price of your new construction does not change whether you have someone represent you or not, so choose representation! will guide you in the different aspects of buying a new construction including lot options, mortgages, construction issues, and inspections. The sales agent at the sales office for the builder works for the builder, not for you. Get the representation you deserve at NO extra cost. 20 St. Andrews Park Villas Are Now Under Construction – Reserve Yours Today! Brand New Home in Port St. Lucie FL For Sale! 6116 NW Kendra Ln Port St. Lucie Home For Sale in St. Andrews Park Villas!